The Norwegian psychologist Martin Soltvedt developed Child Oriented Family Therapy (BOF), which allows for even small children in the family to become involved in the family therapy process by interacting and playing together with the parents in a sandbox. The play is recorded on video and later discussed with the parents. This method of family therapy is appropriate for young children up to the age of 10 or 11 years. Taping, as a technique used in family therapy is gaining more interest and recognition within the fields of social work and psychiatry/psychology and is often used as an investigative tool. With the Taping method, the client or family can give a concrete and visual representation of their social situation and family network. Taping is also used to represent an internal/external conflict or a traumatic event. 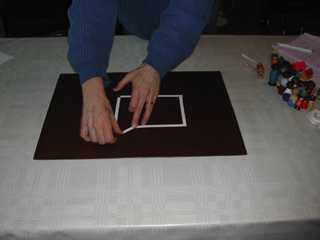 Using tape, the therapist first marks out a square on the table representing the “stage” where the client or family can show an event, a situation or a problem. 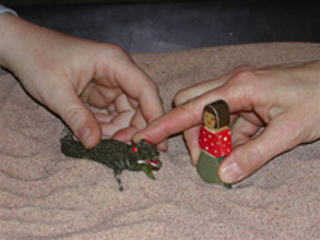 The client is shown a set of wooden doll/figures and is asked to choose a concrete representation of himself or his “part-of-selves”. This concrete and playful symbolisation of the event being discussed and of the people involved often proves to be a non-threatening method to successfully reach, understand, and treat clients, such as small children, who might otherwise lack the vocabulary needed to verbalise certain events or issues. Senast uppdaterad 9 januari, 2018 klockan 19:32.